I recently attended a conference “Israel 2021,” aimed at stimulating a process of long-term strategic thinking in Israel to achieve a vision of Israel as being among the top 15 in terms of quality of life for all its citizens. For Israeli leaders to endorse a meaningful long-term process reflects either a misguided confidence in a continuation of our strong economic performance or a real concern about worrisome trends, it is a refreshing change from the typical storm tossed crisis to crisis pattern of political and economic policy-making. A few years ago, the organization I direct, the US-Israel Science and Technology Commission, embarked upon a similar process as a public-private partnership and at the onset without official government endorsement, to craft a vision for Israel to take its place in the forefront of the world’s economies. Our intensive process, ultimately leading to “Israel 2028: Vision and Strategy for Economy and Society in a Global World” started with a small group of ten mirrored the one at the public conference; with each of us proposing alternative visions of Israel in the year 2028, before melding them into a consensus vision. Israel 2021 seems to have embraced a key recommendation of Israel 2028, that while the government must lead, all sectors of academia, business and civil society must have an equal seat at the table. Only open, ongoing public debate and dialogue alongside diligent, persistent execution efforts supported by a wide societal consensus, will enable achievement of noble, lofty goals. It is also significant that Israel 2021 may have been the first general audience, high-level, government-involved event where “sustainability” was prominent. I sought to introduce this concept into our Israel 2028 vision by seeing Israel leading the world in the development and deployment of solar and other renewable energy technologies in 2028. 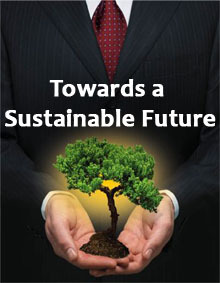 However, “sustainability” is not a slogan that can be easily grafted onto existing “business as usual” models. Rather it demands comprehensive, multi-disciplinary, integrated thinking about the fabric of our relations with the earth and the resources she provides; a true appreciation of the real limits to the existing economic paradigm of continuous growth through ever greater resource exploitation fueling never-ending, “insatiable” consumption. Climate change remains the unseen elephant at the conference, poised to shatter our best intentions and visions; its threats are the driving force behind the current willingness to incorporate sustainability into economic policy; finally a grudging acceptance that we face an uncertain future. Fully embracing sustainability demands a real transformation in the way we perceive globalization and the role of governments and modern corporations. Citizens must demand that their governments be accountable to future generations alike for the impact of our collective actions on the ability of the earth to provide all with the essentials for a high quality of life. In turn, governments that afford corporations’ limited liability protections, must demand corporate responsibility to the public interest now and into the future. Insurers fearing new rules for liability for unchecked climate change are also beginning to demand greater transparency. Seeking to avoid long-term threats to disruption to their business operations, business and industry must become more willing to initiate and lead the transformation. Those that correctly perceive climate change pressures, anticipating and adapting to the challenges, stand to gain, others will be left behind. Since many believe we are already at or near the tipping point in climate change, sustainability of national and local economies, and enterprises themselves will be of increased importance. If global market and supply-chain systems breakdown, we will see our economic well-being more clearly dependent on our local resource base, enhanced by innovation to achieve progress and ensure survival.